The September handmade-of-the-month arrived at Jane's yesterday. Since the weather is starting to turn (hooray! 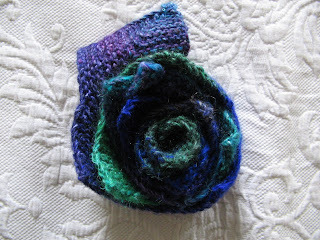 ), I knit a sweet and simple scarf for those blustery days just around the corner. 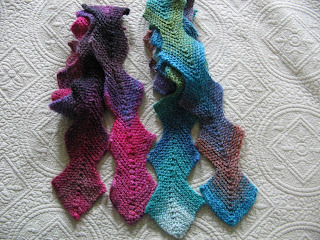 I thought the Edgar scarf pattern from knitty.com might be just the ticket, so I made Jane an Edgar. Not just any Edgar, but Edgar the First. 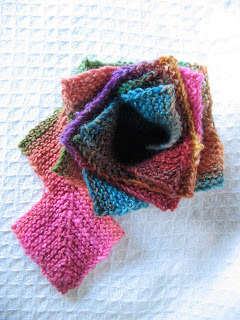 He's knit in Noro Silk Garden in happy shades of pink and orange and blue. I liked this pattern so much I thought I'd make one for Elly too, in blues and browns. And then, I liked it oh so very much, I made one for myself as well, hot pink and magenta. That's Edgar the Second and Edgar the Third. I quickly realised that we couldn't leave Thea out of this scarf dynasty. I love my Edgar! The colours are perfect. My friend, Mable, really liked it too! Mable loved them! Thanks sooo much it's the perfect thing for those cool fall days ahead(with a turtle neck of course)! Not to hot and not to cold!